Today, as Uranus turns direct in Aries, you should be feeling more like shaking things up and breaking new ground in all the different areas of your life. This transit can represent as an innovative and electrifying change in direction, but it can also manifest as an abrupt and unsettling wakeup call. 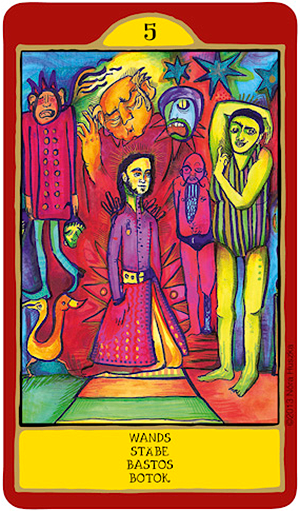 The King of Swords — this version from the fabulous Gypsy Palace Tarot — is a powerful and masterful king. He’s progressive and forward thinking and even a little eccentric. Just like Uranus in Aries. He is intelligent, inventive and accomplished. He’s innovative and progressive. And he’s an expert at communicating his ideas and getting people to listen. But this whimsical version is just spirited enough to capture the dynamic and playful Uranus in Aries transit we’re dealing with and just dignified enough to capture the essence of planets moving through Capricorn right now. This King says you can have the best of both worlds. It doesn’t have to be all work and no play. And you won’t get anywhere if it’s all play and no work. Think about putting your own unique and creative spin on whatever you’re trying today. You can expect good things if put yourself out there, and if you play your cards right you can do it without having to sacrifice any of your own personal flair. You may have to muster up the courage today to let someone know what you’re no longer willing to stand for. You may have to put your foot down and stand up for your rights. 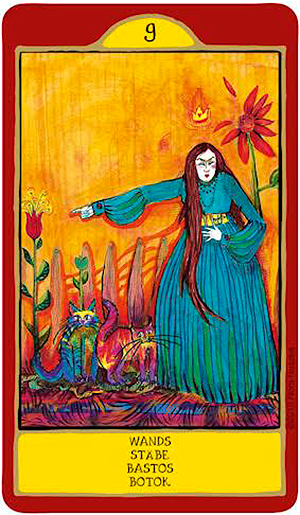 The Nine of Wands — this version from Nora Huszka’s beautiful Gypsy Palace Tarot — says it’s time to gather your wits and rise up against whatever challenges you face, which means you’re also going to have to push your fears and anxieties aside. Have you ever heard of the phrase “blowing your stack?” That’s what it looks like the woman in the card is doing. She’s gotten herself so angry and flustered that she’s blown the crown right off of the top of her head. Whatever it is, it’s clear she means business. She’s standing up for her rights and is not about to take no for an answer. She’s so convincing that even the cats beside her are cowering in fear. The Nine of Wands is all about stamina, perseverance and persistence. It invites you to mobilize your forces, stick with the program and get the job done — no matter what. It says that while you may be wary from the struggles that have brought you to this point, you’re not going to let them get the best of you or cause you to back down. Today you may be feeling more inspired and ready to put some of your bigger ideas into practice. The Page of Pentacles speaks of a enthusiasm, anticipation and a sense of promise over plans that may have been swimming around your head for some time, but that you haven’t done anything about. Until now. It refers to dreams and ideals that may not even be fully formed. There’s an air of anticipation that goes with wanting to see them come to fruition and that may have just needed a nudge to turn them into reality. The Page of Pentacles — this version from the beautiful Gypsy Palace Tarot — is a both a self-made individual and a work in progress. But it’s not all about “work” in the sense that it’s tedious or uninspiring. 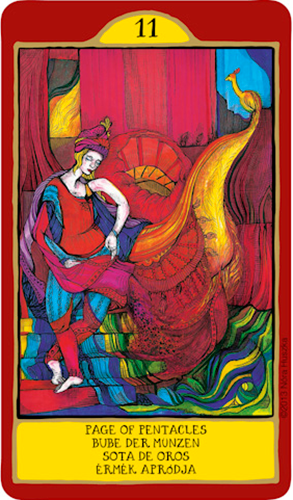 It’s about craftsmanship and inspiration as seen in the colorful figure in this card. You could find yourself putting the finishing touches on half-finished projects in order to clear the way for something else. You could be polishing off your resume, purchasing business attire, or boning up on your studies, in anticipation of something bigger and better on the horizon. Or you could be getting ready to start something brand new — like heading off to college. The Page of Pentacles is excited about creating something and perfecting it, whether it’s on the job or in other areas of his life. Whether this refers to you personally or to someone in your life who reflects these qualities, the idea is to take the ball and run with it. While you may be overwhelmed with the work that’s set out before you, if anyone is up to the task it’s you. You may be thinking about you’ve gotten yourself tangled up in today and how much of it is of your own doing. The Eight of Swords speaks of being wrapped up in something — often your own misery — to the extent that you’re unable to see a way out. 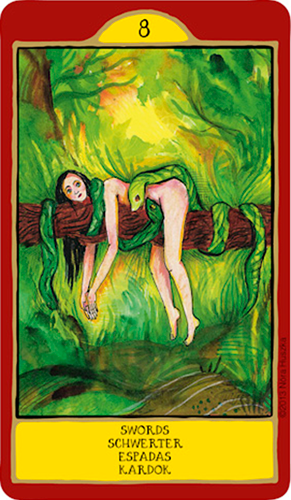 If you look at the image in this card — from the gorgeous Gypsy Palace Tarot — you can see that the woman could easily extract herself from the serpents that have entwined themselves around her and chained her to the tree. But she lies there looking almost dumbfounded and doesn’t even try to move. She’s stuck when she doesn’t need to be stuck. She’s allowed herself to become a victim of circumstances. There’s a definite inability to see the forest for the trees vibe to this card. And that all stems from being too focused on how you might be trapped rather than figuring out ways to get out. Notice the Sun shining through the clearing on this card. And the pathway which is only partially obscured. If she wanted to plan her escape route, that’s the first place to look, although it doesn’t look like the woman in this card has even bothered. You’ll have to look at both how you’ve contributed to the situation you find yourself in and the best way to get yourself out of it. At the very least you’ll have to find the motivation to start moving toward a solution. That solution is likely right there before you, and it may be clear to others even if you can’t see it yourself. You can either unwind yourself from the restrictions that have rendered you immobile, or you can retrace your steps and back yourself out the same way you came. Today, as Saturn retrogrades back into Scorpio, you may feel the need to a break from distractions around and focus on seeking your answers from within. While Saturn is retrograde, it’s also now back in mutual reception with Pluto, making your journey into the underworld a little bit easier to bear. 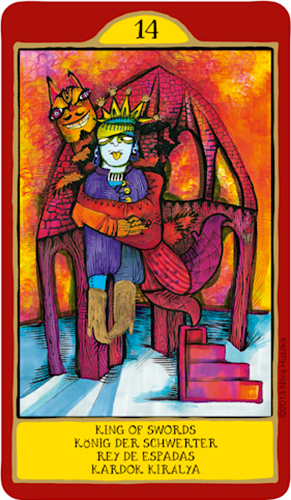 And while the figure in this card — from Nora Huszka’s gorgeous Gypsy Palace Tarot — may lack human companionship, she’s hardly from alone. Notice the birds and fish that surround her, which may or may not be real. They may just reflect the psychic content of her own thoughts and ideas. 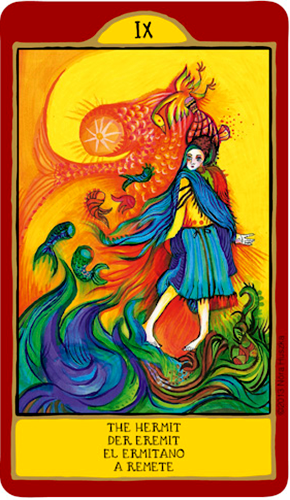 As the Hermit card also refers to turning inward, there is an entire spectrum of information — from the depths of the psyche (represented by the sea creatures) to the heights of conscious awareness (represented by the sky creatures) that can be accessed through this process. The waves at her feet look almost like flames. She turns her attention to the blue and indigo flames, representing intuition and higher consciousness. As water also represents feelings, these fiery waves can refer to the alchemical process of transmuting your emotions into something that can be worked with dynamically. The Hermit card can appear at a time when you’re so bombarded with external stimuli that you just want to “get away” from it all. Notice the bird at the top of the card liberating himself from his cage. Be careful that you don’t spend so much time in your head that you miss out on opportunities that present themselves. They may seem random in the moment but reveal themselves later to be much more important than you’d realized. You may feel like life is a bit of a struggle today, or that all of your efforts are being met with resistance. As Mars opposes Saturn and Venus squares the Nodes, you may be feeling overwhelmed with the amount of work laid out before you, especially if you’re trying to accomplish more than is humanly possible (and let’s face it, you probably are). The Mars / Saturn opposition is the classic “running into a brick wall” aspect, which can can be incredibly frustrating, as the part of you that wants to make things happen (Mars) keeps getting thwarted by external events (Saturn). This can be a person, such as a boss, partner, or authority figure, or if can be an event, such as an impossible deadline or unexpected delay. The Venus / Node aspect says you may feel shut out or alone, or that the support youre looking from from others just isn’t there. 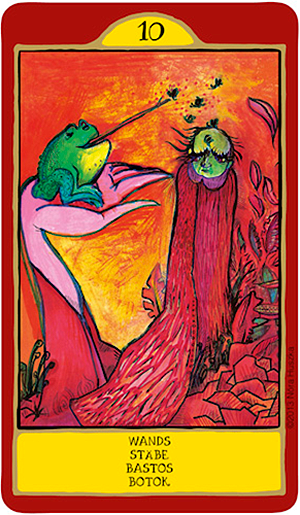 This version of the Ten of Wands, from the gorgeous Gypsy Palace Tarot, takes a light-hearted look at this scenario. As the man tries to make his way up the incline before him, his efforts are undermined by a tree frog’s subversive acts. Everything about this card says “hard work” and “frustration.” The incline is rocky and treacherous. The man’s robes are cumbersome and stiff. And his arms are held down — or at least hidden from view — so much so that he’s not even able to swat the flies away that are buzzing around his head. You may be overwhelmed with all that’s laid out before you today. And you may be wondering whether you even have it in you to keep on plodding ahead. But as you can see from this card there’s no turning back. This is the Ten of Wands dilemma: You can’t exactly throw in the towel and say “I’m done.” There are obligations and responsibilities to uphold as well as people who depend on you who’d likely be hurt by your neglect. The question you might want to ask yourself today is this: “Is life (or love) supposed to be this hard?” The value of whatever it is that’s taxed you to your limits probably needs to be reassessed. Today’s Mars / Jupiter square can awaken your competitive drives as well as your fighting spirit — for better or worse. This is a larger than life aspect that tends to magnify all the Martian impulses: anger, aggression, impatience and combativeness. It may see you acting without thinking or ignoring repercussions. On the up side, this transit can increase your natural confidence and self-esteem. It can see you feeling invincible, to the extent that you’re willing to put yourself out there — letting nothing stand in your way. But on the downside it’s careless and potentially reckless — especially if you allow your ego to take charge. 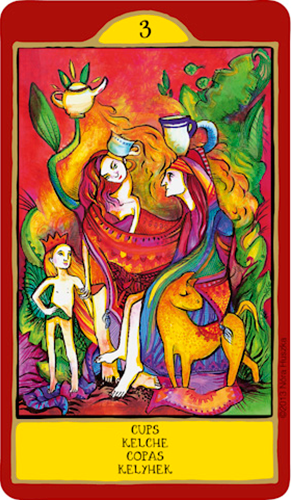 The Five of Wands — this version for the beautiful Gypsy Palace Tarot — refers to conflict, strife and competition: forcing your will on others, trying to be heard above the “roar” of opposing viewpoints and struggling against cross-purposes. You may have to look at where you may have been pushing your views forcefully onto others. You might not even realize that you’re doing it, yet your actions can translate as pressure, at at least on some subconscious level. Petty squabbles can erupt into major arguments because no one’s actually listening to what anyone else has to say. The important thing to remember is that most disagreements are based on misunderstandings in the first place. The inability to put ourselves in someone else’s shoes –- coupled with the need to be heard — is behind almost every argument out there. And this combination can be a recipe for disaster. The New Moon in Aries also takes place today: This can exacerbate those impatient, combative and aggressive tendencies. Because of this, there may be certain topics that ought to be automatically off limits today. Like politics and religion. Not because they’re unimportant, but because everyone involved is going to be already so invested in their own point of view that absolutely no progress can be made. This is a day of relaxing, rejoicing and counting the blessings that surround you. 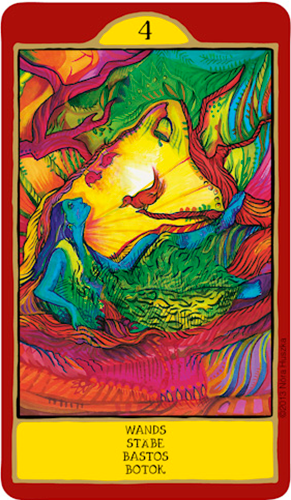 The Four of Wands is often portrayed as a joyous celebration, a gathering, a reward or surprise — the affirmation that all of your hard work has paid off and is now worthy of being celebrated. In this version there are definite symbols of merriment and wonder: the singing birds, the ringing bells, the vibrant colors,and the glowing aura that envelopes the woman as she lifts her face to the sun. But there’s also emphasis here on gratitude and contentment; the satisfaction that comes from being at one with the Universe, in harmony with yourself and your surroundings. You may have been so caught up in accomplishing your goals that you haven’t had time to appreciate the progress you’ve made. The Four of Wands says it’s ok to give yourself a chance to take a breather. It’s ok to stop and smell the flowers. It’s ok to step back and admire all of your efforts, knowing that they continue to gather momentum and will keep on keeping on even if you decide to take a break. The Knight of Pentacles is generally all about taking things slow and steady with a keen eye on the future and the discipline to keep “plodding along” as you move toward your destiny. Don’t make the mistake though of focusing too much on the nuts and bolts of achieving success. If there’s any negative aspect that can be associated with this card it’s usually the dearth of inspiration that can lead to getting stuck in a rut of tedium and routine. But this Knight of Pentacles doesn’t appear to be lacking in inspiration at all. 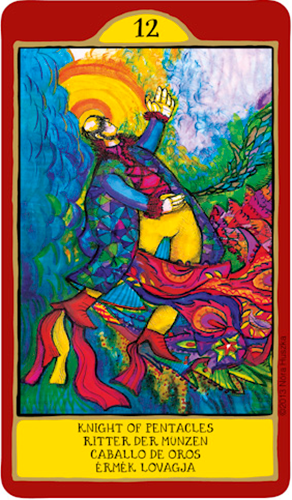 We see him pausing at the onset of a vibrant and colorful path, reaching up to the heavens. Is he praying for guidance or expressing his gratitude? The greatest obstacles are behind him. He steps out of the darkness and into the light and sees a great big colorful world out there ahead of him. 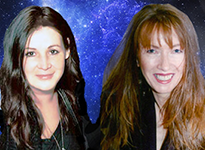 This is a high energy day with just as much potential for things to go haywire as there is for magic to transpire. 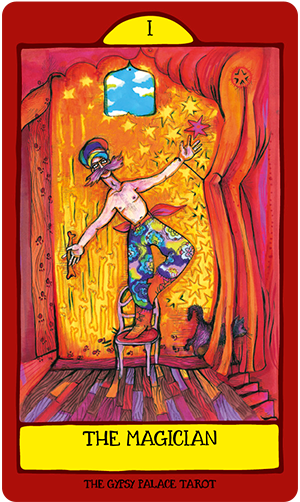 The Magician card encourages us to make the best use of all of the resources at our disposal. Especially during stressful times. The Magician — like the Fool — already has everything he needs. But unlike the Fool, he’s consciously aware of it. Notice the black cat exiting the stage on the right. He’s left his paw prints all the way down the wall and across the backdrop. He’s traipsed all over the stage yet doesn’t seem to have distracted the Magician at all. That’s the kind of composure you wan to cultivate during this time or at any time that life become stressful. Mars and Uranus are in opposition today. This can be a extremely volatile opposition, and has been known to correlate with cataclysmic events. But it doesn’t have to, and certainly not in your world. In my book there are two ways to handle oppositions. The first one has to do with “owning” one side of the opposition and projecting the other one outwardly, onto another person or an event. The other — and my preference — is to see it as an opportunity to balance and integrate those opposing forces.